Founded off the back of a deep passion for contemporary ceramics, Maud and Mabel is a beautiful, understated boutique in Hampstead. Shopkeeper Karen takes great care in sourcing her wares, exploring work by artists at graduate shows as well as those she finds on her travels. 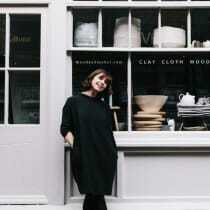 Each product sold in Maud and Mabel is sourced directly from the artist, and the boutique's catalogue currently comprises at least fifty potters worldwide. "I find retail is moving increasingly towards online shopping. However, I am aware that this in no way replaces a visit to the personal atmosphere of a calm gallery showcasing extraordinary crafted pieces which can be held and experienced."